Father Bishoy Gobreial was born in Egypt in 1928 and earned a Bachelor of Science degree in Chemistry and Agricultural Sciences from Cairo University in 1951, and a diploma in Biology. He worked as a teacher in horticulture landscaping for many years. He came to the U.S.A. in 1970 and was a Sunday School teacher at St. Mark Church in Los Angeles. 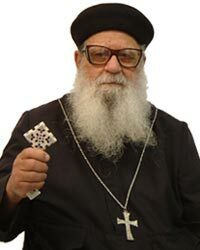 His Holiness Pope Shenouda III ordained him on February 18, 1979. His promotion to the priestly rank of Hegumen was on October 29, 1989. He is serving at Saint Mark Church in Los Angeles, California. He has been serving at the St. Mark Church in Los Angeles since 1979. He was instrumental in starting churches in Bellflower, San Fernando Valley, West Covina, Santa Monica, Torrance, Fresno, Bakersfield, Las Vegas and Honolulu over the past 25 years. On Sunday, September 14, 2014, having completed his good strife, he departed into eternal rest. May his memory be eternal!